Morocco has invested heavily in ports infrastructure to become a competitor of its European neighbors, Spain and Portugal, in port-related items in international rankings, Jaime Pérez-Seoane de Zunzunegui, regional editor for North Africa for Oxford Business Group told the Wall Street Journal. “Morocco’s ports really shine, ranking 16th globally for liner shipping connectivity, and 28th for efficiency of seaport services,” the paper said in an analysis on Morocco’s infrastructure. Tanger Med II, slated to open this year, will add six million container capacity and push the port into the top 20 globally. 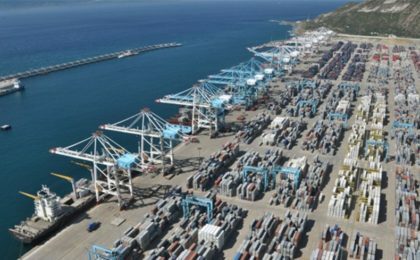 Last year half Morocco’s exports transited through the deep-sea northern port. Morocco has invested heavily in building international airports and container ports that serve as the World’s platform to Africa, the Wall Street Journal said. “The quality of Morocco’s infrastructure-particularly its transport networks-reinforces its potential as the world’s portal to Africa,” the US paper commented. It recalled that Morocco has 18 airports among them 16 international, linking Morocco to the main economic capitals of the world. “Airports have upgraded to allow for doubling traffic by 2020, and, in Marrakech, tripling capacity to nine million passengers,” it said. The launch of a high-speed train service linking the country’s major financial and economic hubs of Casablanca and Tangier will further link business communities and facilitate investments, the paper said quoting specialists.